My goal is to meet you where you are in every area of your life, finances included. Please do not let finances stand in the way of therapy. A limited number of sliding scale sessions are available for those experiencing financial difficulty. Contact Kylie to discuss availability, details, and fees. Fees are collected in full at the beginning of sessions in the form of Venmo, check, or cash. 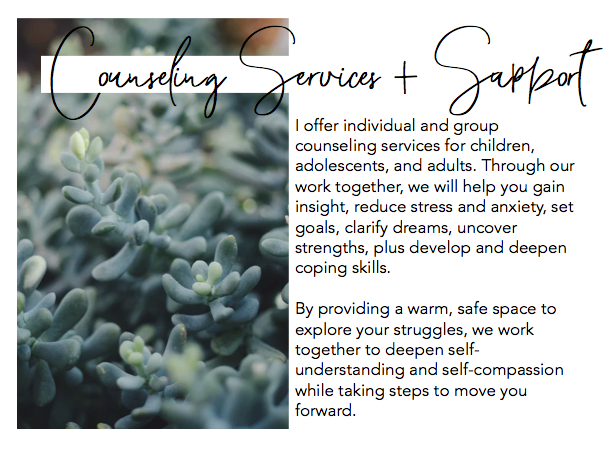 If it seems like a good fit, please reach out via text or phone 1 (205) 223 2768 or by email to make an appointment or schedule a free 10-minute call to discuss what’s bringing you or your child to therapy. I’m also happy to share insight into my style as a therapist. Next, we’ll set an appointment and I’ll follow up via email with instructions on accessing my office, along with a few forms to fill out. Please bring the completed forms to our first session. We start with an initial consultation period of a few sessions. During this time we’ll discuss your history, current situation and concerns, and goals for counseling. We’ll also explore resources and helpful tools to practice between our sessions. This consultation period allows us to get to know one another and explore how best to serve you or your child’s needs. Over the past few years I have practiced counseling, I have supported my clients through a variety of issues. Many are noted below.